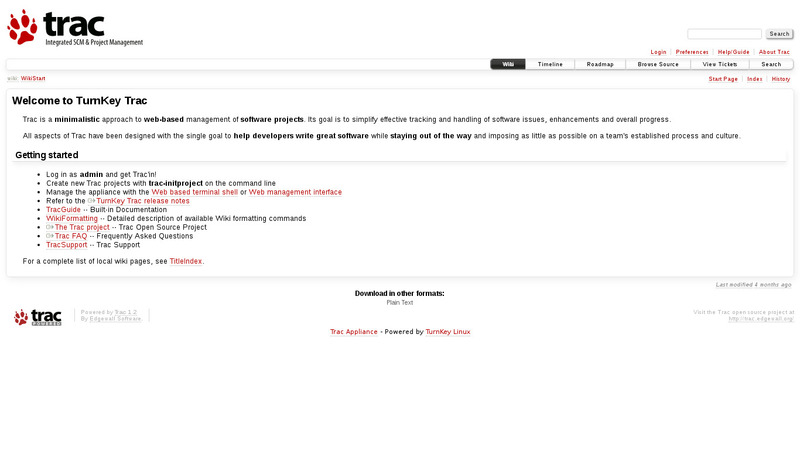 Trac is a web-based project management and bug-tracking tool. It allows hyperlinking information between a computer bug database, revision control and wiki content. It also serves as a web interface to the revision control systems Subversion and Git. Among the users of Trac is NASA's Jet Propulsion Laboratory. Installed from package management. See /var/www for links to file paths. Supports Git and Subversion (Bazaar and Mercurial no longer supported). List repositories in web interface. Site wide authentication realm and admin user. Uses python-pygments for syntax highlighting. Repositories are stored in /srv/repos. To simplify creating new projects, helper script trac-initproject is included. Please refer to the Trac documentation for usage notes on how to create and access projects. Ignore SSL browser warning: browsers don't like self-signed SSL certificates, but this is the only kind that can be generated automatically. If you have a domain configured, then via Confconsole Advanced menu, you can generate free Let's Encypt SSL/TLS certificates. Note: some appliances auto direct http to https.